Dun Eistein ("Dun Esh-ten") is the ancient stronghold of the Morrisons of Ness, the family which held the hereditary Brieveship at Habost in the Isle of Lewis under the Lords of the Isles. The Dun is a "sea stack" - an elevated area similar to a mesa which is isolated from the mainland of Lewis by the sea at high tide; at low tide the Dun is accessible by foot. Regular human occupation ended hundreds of years ago, after the Morrisons of Ness were broken by the MacLeods. The remains of a number of structures are still there, however, leaving a record of the prior occupants which has been waiting to be explored. In 1999 the Clan Morrison Society of North America undertook a fund-raising campaign. The objective was to raise the necessary funds (£20,000) for a preliminary archaeological survey of Dun Eistein. This campaign was successful, and negotiations with the Glasgow University Archaeological Research Division (GUARD) led to an agreement for the performance of the work. The analysis of the Dun Eistein monument and the island landscape is documented to modern standards. Accurate mapping of the site and surrounding landscape. Obtaining safe access to the site. The work led to the publication of a report describing the study findings, which has been posted on the GUARD web site (see Appendix). The report describes the work done in detail, giving preliminary conclusions about the structures on the site as well as details on the survey methodology used. The report was summarized in an article published in Fios, the North Lewis Weekly, on November 17, 2000. This article was written by Dr. Stephen Driscoll, research director of GUARD, and Dr. Chris Barrowman, the field team leader. Phase II of the survey was conducted in May-June, 2001. This phase consisted of a Geophysical Survey of the Dun, combined with the excavation of a series of test trenches in promising locations. 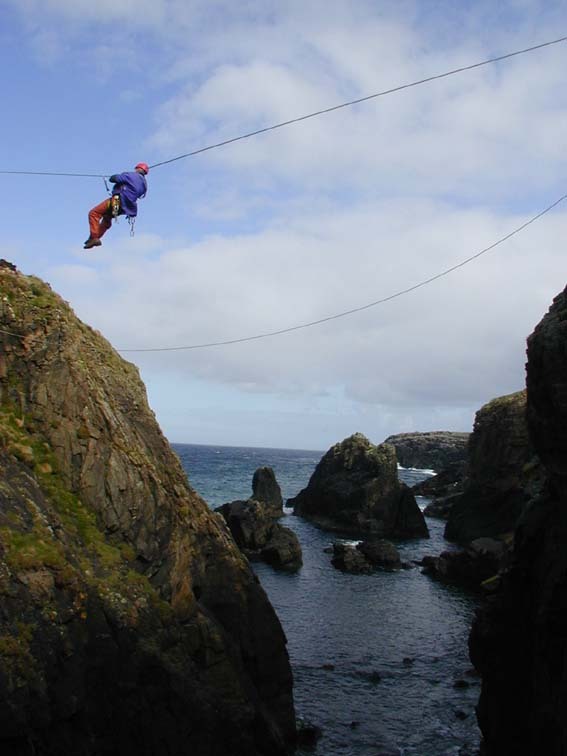 To improve access to the site, a Tyrolean Traverse was installed, allowing the archaeological and geophysical team members to get on and off the Dun without being dependent on the state of the tides. Dr. Chris Barrowman, the leader of the field team, posted weekly status reports on the web site of Comunn Eachdraidh Nis. These reports enabled the friends and supporters of this work to keep up with what was happening. to identify any further archaeological structures not visible on the surface. to clarify the extent and morphology of the visible structures, to help determine where to locate the trial trenches. to refine our understanding of the archaeological resource by characterising the nature and extent of buried deposits and determine whether they could be linked to the standing structures. to assess the potential of the deposits within the lochan (Structure E) for environmental studies and for waterlogged objects. The preliminary survey produced a number of exciting discoveries. 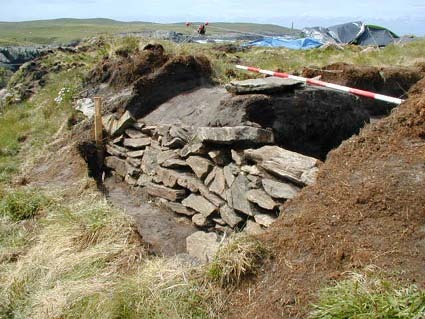 It now appears that the "Dun" on Dun Eistein is a small tower house or "keep", and not the more usual "broch". This keep may rest upon the remains of an earlier and structure built on the same site. Glass fragments have been discovered of a type common in bottles made in Germany in the 16th century. It now appears that at some period in its history, Dun Eistein may have been a center for trade and commerce, occupied on a more or less permanent basis and not just a refuge for use in time of danger. Much more work needs to be done to confirm this hypothesis, but it seems that there is a real opportunity to greatly increase our store of knowledge about life in Scotland during the Middle Ages. 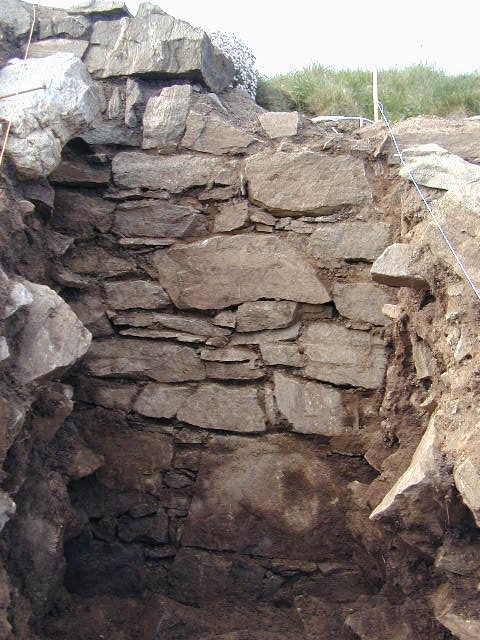 The topographical, geophysical, and archaeological studies completed to date confirm that Dun Eistein is a site of great archaeological and historical importance which demands further investigation. A plan has been developed for further investigation of Dun Eistein during the years 2002, 2003, and 2004, combined with additional historical studies to try to determine more about what life was like on Dun Eistein. The final reports and other documentation, including a book oriented to the general reader, will be developed in 2005 and 2006. The cost of this effort is estimated to be in the range of $600,000 to $800,00. Most of this money is obtainable from various governmental bodies and historical associations in the United Kingdom, but it will still be necessary to raise a substantial sum through private contributions. The project has captured the imagination of the people of Lewis, and is now being enthusiastically supported by Comunn Eachdraidh Nis (the Ness Historical Society) and by Comhairle Nan Eilean Siar (the Council for the Western Isles). Sufficient funding has been obtained to construct a bridge to Dun Eistein from the mainland of Lewis, along with an approach road. The bridge was dedicated on July 24th, 2002 in a ceremony attended by Morrisons from around the world who were attending a Gathering of the Clan to learn more about the project. The tyrolean traverse which was used during the 2001 field season is no longer be necessary. The Clan Morrison Society of North America is qualified under Section 501(c)3 of the Internal Revenue Code as an Educational Charitable organization. All contributions are tax-deductible and will be receipted. http://www.c-e-n.org - scroll to the bottom of the home page and click on "Dun Eistean" on the left. http://www.cne-siar.gov.uk - when the icon menu loads, click on the WIAS icon (in the bottom row). Then scroll down to "Dun Eistean" on the left and click. This leads to a more complete set of field reports and information than the NHS link.